This is fantastic news for Yankees fans everywhere. Two all-time great Yankees are now directly involved with the Miami Marlins. Don Mattingly, who is the Manager of the Marlins and now Jeter as the owner, the Marlins are basically Yankees south. Both Mattingly and Jeter are beloved by the fans in the Bronx, and I’m sure the Marlins are now their best team in the National League after the news today. There were rumors for many weeks that either Jeets or Alex Rodriguez would go ahead and buy the Marlins who were up for sale. Jeter has gotten the upper hand on A-Rod once again. I do think Alex will also be an owner one day, but I think his focus right now is being a great TV analyst and then go into coaching. For many years, the Marlins have had people running the franchise that are not born winners. Mattingly, though he might not have a lot on the field, still has the mentality needed to win. If you wanted someone on the cover of the book that tells you how to win, Jeter’s face would be on it. 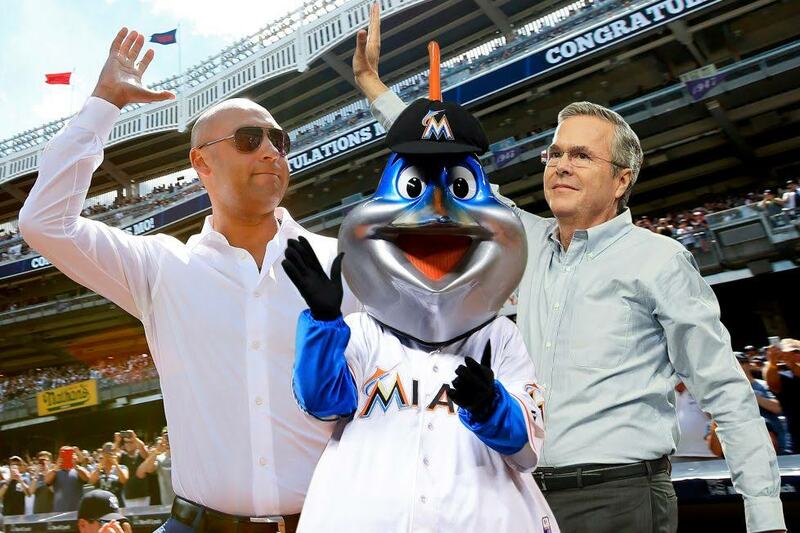 Jeter has won at everything in his life, I am 100% sure he will be a great winning owner of the Marlins. Partnering up with Jeb Bush, might complete one of my lifelong dreams, Jeter running for public office. Jeets would be a great politician, and that is the only politics I will be talking about in this blog.